In MadCap Flare 2017 r3, we introduced a new feature that lets you evaluate your Flare project content for readability, average sentence length, and more. To run a text analysis, open your content file (e.g., topic, snippet). Select the Tools ribbon. In the Proofing section select Text Analysis. The Text Analysis window pane opens. After you click “Analyze”, you’ve given results that show the reading ease score, grade level score, and more. But what exactly do these numbers mean? Scores are based on “The Flesch Reading Ease” and “Flesch-Kincaid Grade Level” tests. The “Flesch Reading Ease” generates a score between 1 and 100 that roughly correlates to how easy or difficult it is to read the text. The higher the score, the easier it is to read the content. And if the score is low, the harder it is to read. To make sense of the “Flesch Reading Ease” score, we’ve made it easy in Flare with colored bars; a green bar indicates a good score, yellow indicates an average score, and red indicates a poor score. The “Flesch-Kincaid Grade Level” test is another readability metric based on the grade levels in the United States educational system. The score indicates the reading level; for example, if your content is rated as a 6, then it correlates to a sixth grade reading level. When it comes to public-facing documents, the best practice is to aim for an 8th grade reading level. Long story short – you want to aim for a high reading ease score and a low grade level score. 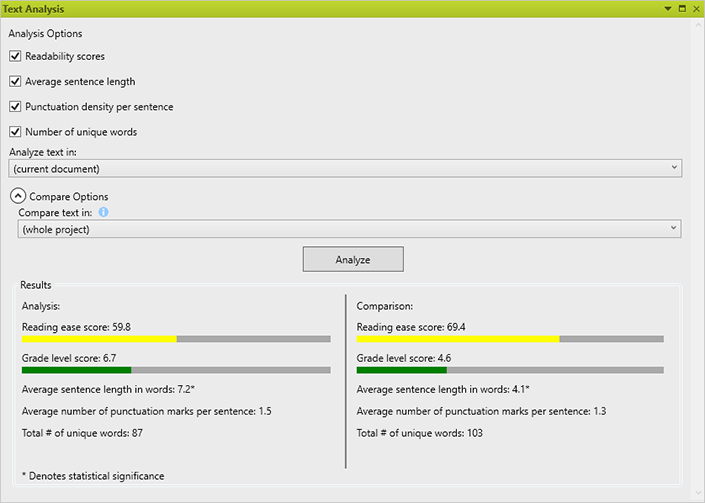 When analyzing content, the Text Analysis tool gives you a result on the average number of words in a sentence. A common best practice is to aim for 20 to 25 words in a sentence, but this rule varies depending on the type of content. One guideline is to focus on the amount of information conveyed in a sentence. An appropriate length is if the reader is able to remember how a sentence begins and ends. Use bullet points to break up sentences crammed with information, or separate into shorter sentences. Comma Splices: Break up sentences where two independent clauses are separated by a comma. Quotation Marks: Instead of using quotation marks to convey emphasis, consider italicizing, bolding, or underlining the word instead. To learn more about common punctuation issues, click here. Long paragraphs with few breaks can quickly tire out a reader. This is especially so for online content, where attention spans are short and users are quickly looking for an answer. Aim to end a paragraph after a couple of sentences. Another result in the Text Analysis tool shows the total number of unique words used in the content. If the number of unique words seems low compared to the word count, then it may indicate that there are repeated words throughout the content. Look for whether sentences start with the same word, such as “I” or “we”. Or maybe there’s a particular word that’s repeated throughout the content. In short, this metric lets you know when there’s an opportunity to add more variety throughout your text. There are numerous other factors that enhance the quality of copy, including structure, design, and more. But for users looking for a starting point, the new feature in Flare provides an opportunity to understand the overall readability of your content. Want to evaluate your own content? Get stared with a free 30-day trial of MadCap Flare, which comes with free inquiries to our Platinum Level technical support. If you have any questions on how this specific feature works, a technical support team member is ready to assist you. As Marketing Manager, Rachel oversees various aspects of MadCap Software's marketing strategy, including content marketing, online advertising, social media, and events management. She has nearly 5 years of digital marketing experience, encompassing content, marketing automation and analytics.